Had a bit of success thrifting yesterday. While I was getting ready to put all my new items away I placed them them all in the basket to make carrying downstairs easier...and thought to myself: "Hey! That may make a decent blog post picture!" 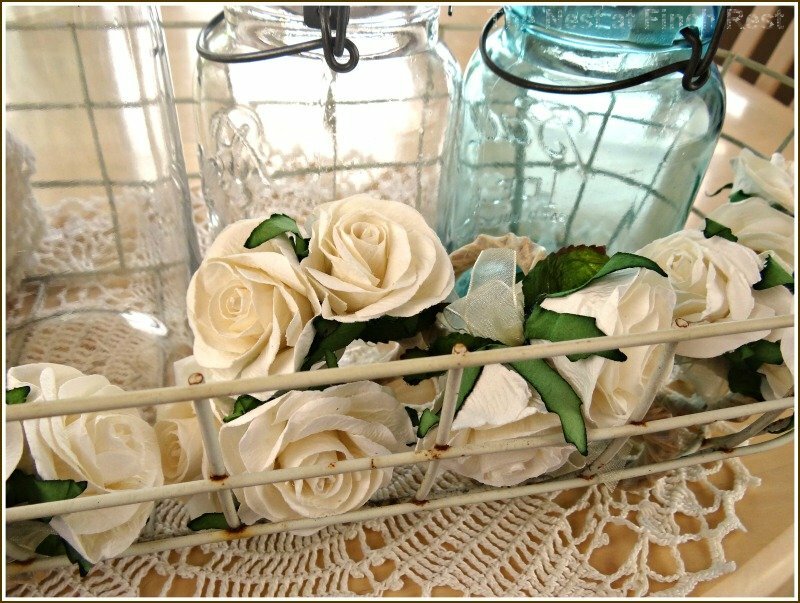 One large rusty metal basket, one large and two small old glass top Ball canning jars.....some old crocheted items and perfect white paper flower napkin rings organza-wrapped around wicker..............all playing nicely with one another. Funny how often it turns out that the unplanned things are sometimes the best in the end. Here's to many unplanned little happinesses to you all. You are so right! They make a great blog post and an even prettier picture! 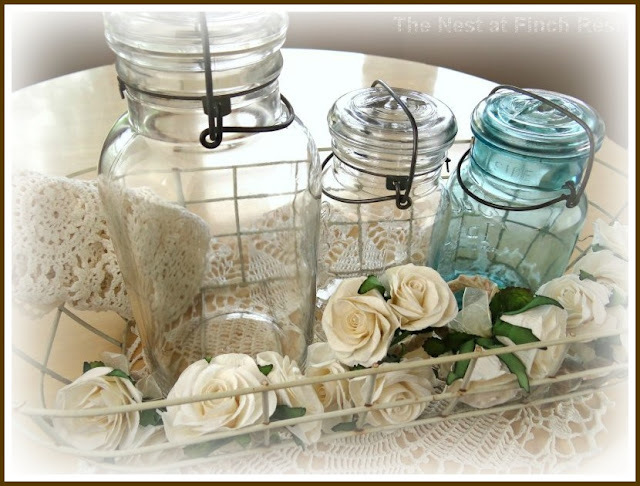 That looks so pretty--love the basket, the canning jars and those napkin ring roses are beautiful! So sweet. Love Ball jars...this looks great. Unplanned bliss....some might call it serendipity!!! Very pretty! Unplanned or no! Love it! I can't tell you how many times ladies have reached into my basket to "admire" stuff. It's uncanny how great it all looks in the basket. 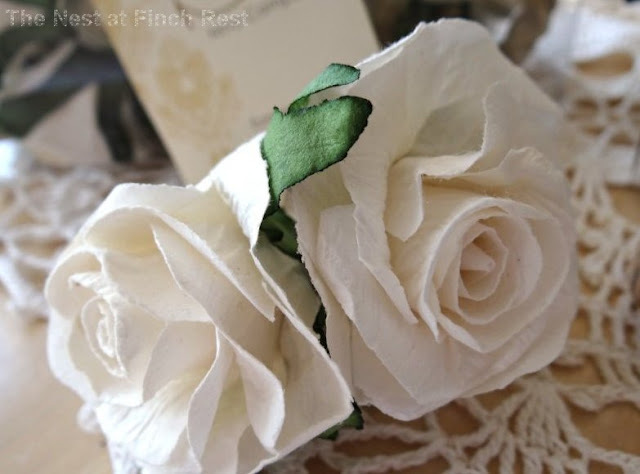 Love the white paper flowers! I went looking for the Hobby Lobby ones with script and COULD NOT BELIEVE what they cost. Well, not this week for me. (they were half price last week) This post is right up my alley! Too funny! I just left this follow up message on Judy's blog accidentally instead, and she won't know WTH I am talking about! HAHAHA! But I forgot to tell you you HAVE to see Casablanca! It's screening in theaters starting tomorrow! Perfect way to see it for the first time! No kidding? WOW, I will look into it. I think Bogey and McCall would be proud of you. It was meant to be. Any time you put mason jars in a basket magic happens! I love when these accidental decorating displays happen, Michele! This one worked out well and I love the different elements that came together here. Just arrived in Colorado. And I'm pooped. Just got on email and saw your post and I dont know when I'm going to get a chance to respond so am taking the opportunity n ow. Love your finds. They are things I would pick too. You'll do wonderful things with them. I just love these mason jars ...And you are totally right , often the unplanned things turn out better than our expectations and grand plans. I love the glass jars. Your photos look beautiful. What a beautiful little vignette. They are playing very well together. Oh the vignette is beautiful! The most beautiful vignettes are those unplanned one! This one is gorgeous! I would just leave them as they are in the basket Michele. placed on a little shelf or table. Isn't it so fun when something comes together so unexpectedly like this! It is a lovely vignette! Love you pretty pillow from the previous post also! Wow, simple and sweet, is right! So beautiful. Glad you noticed and shared the image! I found you through Rooted in Thymes' Simple and Sweet link party. Hope you'll stop by my place sometime. I love the Mason jars too. I can remember my Grandmother having several but I don't have a single one. 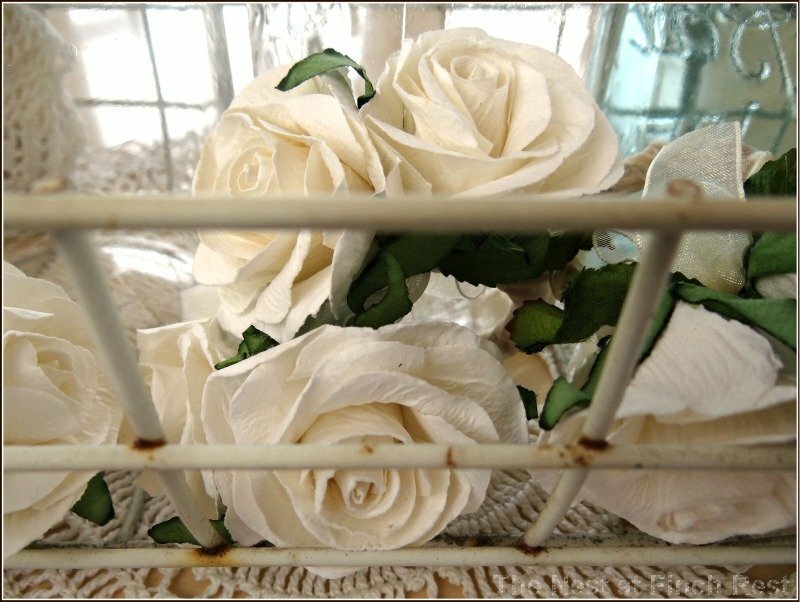 The roses look pretty in the carrying basket, good ideas for the pictures in the basket. Well you were right. But it's more than descent. It's exquisite. Looks like something right out of a magazine. Thank you. Thanks so much for linking up this beautiful inspiring post. It's always good to hear from you. Have a great week!